Mines and munitions dumped in the oceans during twentieth century wars could still kill you today. 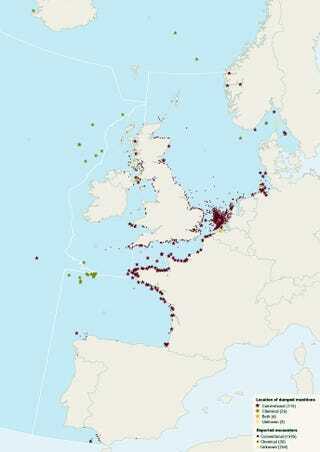 Atlantic inter-governmental organisation OSPAR helped put together this map of dumped munitions in coastal Atlantic waters. It's not pretty. Vast amounts of munitions were dumped at designated sites or randomly jettisoned into the sea following the First and Second World Wars. These included conventional munitions such as bombs, grenades, torpedoes and mines, as well as incendiary devices and chemical munitions. The presence of munitions in the sea is a risk to fishermen and coastal users. As recently as 2005, three fishermen were killed in the southern North Sea when a Second World War bomb exploded on their fishing vessel after having been caught in their nets. There are also concerns over the many chemicals used in the munitions, which may be released as the munitions degrade with the possibility of risks for the marine food chain.